New Delhi: Thai Prime Minister Prayut Chan-o-cha arrived in New Delhi on Thursday for a three-day visit, with an aim to deepen bilateral cooperation in areas of trade and investment, defence, security and tourism. Chan-o-Cha will have extensive talks with Prime Minister Narendra Modi on Friday during which both sides are likely to explore ways to expand maritime security cooperation, deal with threat of terrorism and boost trade. There are indications that both leaders will discuss the situation in the South China Sea. The Thai Prime Minister is accompanied by his spouse Naraporn Chan-o-cha and a high-level delegation comprising several cabinet ministers, senior officials and a 46-member business delegation. Chan-o-cha's, who arrived on his first visit here as Prime Minister, was received at the airport by Minister of State for Home Kiren Rijiju. "India's excellent relations with Thailand are an important and integral component of India's strategic partnership with Asean. 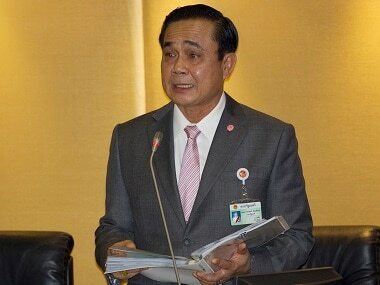 India's 'Act East' policy is complemented by Thailand's 'Look West' policy in bringing the two countries closer," the External Affairs Ministry said in a statement. Modi will host lunch in honour of his Thai counterpart on Friday. The Thai PM will also call on Vice President M Hamid Ansari. Chan-o-cha is expected to deliver a speech at the business event hosted by Ficci, CII and Assocham on 17 June. The India- Thailand Joint Business Forum will hold its first meeting during the visit and make recommendations for boosting trade ties between the two countries. He will visit Bodhgaya on Saturday before returning to Thailand. "India and Thailand have strong economic synergies and the diversifying profile of growing bilateral trade and investment reflects the growth and maturity of the interaction between the two economies," said MEA. Issues related to the proposed Free Trade Agreement between the two countries are likely to figure in talks. The volume of current annual bilateral trade between the two countries is nearly USD 8 billion and both sides are keen to expand it further. Earlier Prime Minister Yingluck Shinawatra had paid a State visit to India in January 2012 and was the Chief Guest for the Republic Day celebrations. Maritime security cooperation between the two countries countries in the Indian Ocean is already "very strong", said Secretary (East) in the Ministry of External Affairs Preeti Saran, adding ways to further enhance it may be explored during the talks. Thailand has shown interest in joint ventures in defence production and procurement of defence platforms from India.